Igor Savelyev’s short novel Терешкова летит на Марс (Mission to Mars in Amanda Love Darragh’s upcoming translation from Glas) takes a dim view of the generation that was in its early twenties during the final moments of December 31, 2006, when Mission to Mars opens. The first sentence in the book is “Путин замолчал.”—“Putin fell silent.” Now that Putin has finished his New Year’s Eve address, there are shots of the Kremlin, then the Russian anthem plays and “2007” flashes on the TV screen. Mission to Mars focuses on Pasha, an unfocused, unmotivated guy whose very focused, very motivated girlfriend, Natasha, has just moved from provincial Russia to Pittsburgh. Pasha’s the guy who chose the vaguely named “social-humanitarian” department of the pedagogical institute for his higher education: the department is best known for a deficit of males and low admission standards. Pasha’s two best friends are a guy from another city who moved away from some juvenile crime problems and an aspiring writer. Pasha manages to find himself a job at the airline ARTavia, where Max, a distant relative, works. The airline focuses on вип-клиенты, VIP clients, flying them to Moscow (and only Moscow!) on planes that are all business class. The best part of ARTavia, however, is that it promises no crashes: Max says their liners just can’t, won’t, wouldn’t crash. Ever. ARTavia even holds regular meetings with clients to pound that into their heads like a mantra. Almost literally: it’s interesting to see how Savelyev portrays corporate promises and loyal clients almost like a cult. Pasha, however, learns certain truths about ARTavia and, with a little help from his afore-mentioned friends—and Olga, a young woman whose wealthy parents signed her up for ARTavia—reveals it to the public. Savelyev consistently portrays Pasha as someone who respects people who are goal-oriented—e.g. Natasha, who’s primarily a distant presence—but Pasha just is what he is, writes Savelyev, complete with failures, ups, and downs. It doesn’t make for a very hopeful picture. It’s telling that the figure in the book with the biggest goals isn’t a fictional character: she’s cosmonaut Valentina Tereshkova who, despite being 70 years old, says she’d like to fly to Mars. Tereshkova, by the way, really did say that in an interview with a reporter, even answering a question about UFOs by saying she hasn’t seen any but might if she were to fly to Mars. Mission to Mars reads fairly easily and Savelyev does a nice job placing his characters within a social, personal, and mental stagnation that feels constructed specially for an aimless, hopeless character like Pasha. And his friends. Details like an escalator lady in Moscow and a reference to Twin Peaks add another layer to Pasha’s reality and unreality. The novel is funny at times but it’s also very bleak, so I felt myself wincing more than once at quietly sad details of lives and life… and the feeling of being trapped, something Savelyev describes with substantial success. Up Next: Evgenii Vodolazkin’s Laurus, which I’m still enjoying. Disclaimers: I’ve met, briefly, Igor Savelyev several times at book fairs and events and am working on translations for publisher Glas. 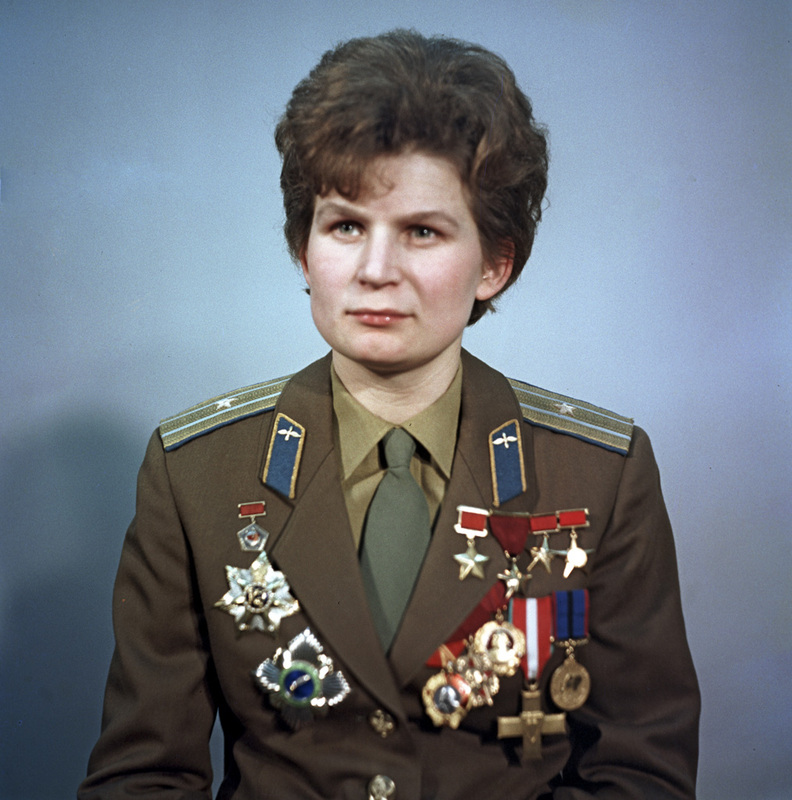 Photo of Valentina Tereshkova in 1969, from RIA Novosti, Creative Commons. Awards first: Irina Povolotskaya won the Belkin Prize earlier this month for her Пациент и Гомеопат (The Patient and the Homeopath). And Academia Rossica announced this week at the SLOVO festival that Pola Lem won the Rossica Young Translators Award. On to conference with book fair: I went to slushy Boston earlier this month for the Association of Writers & Writing Programs conference. The AWP conference is a gigundo event that’s as impersonal as the organization’s name… though I did enjoy a few of the panels and, of course, the book fair, which included lots of small presses and journals. Some conference highlights… for writing technique: Peter Elbow’s talk “The Wisdom of the Tongue: Harnessing the Music of Speech for Good Writing,” looked at intonation units in speech and gave me some great theory to back up my practices for translating dialogue. I can see why one writing teacher told me Elbow’s considered a rock star in the field; I was only too happy to order up his Vernacular Eloquence… for translation: panels on Polish poetry, where it was fun to recognize commonalities with Russian, and hearing James Ragan read from and speak about his translations of poetry by Yevgeny Yevtushenko. Ragan said he never stops worrying that he missed something or somehow failed… for disappointment: the lowestlight of the conference was that the room for the panel “Opening Her Veins: Variations on Poems by Marina Tsvetaeva in Two Voices” was so far beyond SRO that I couldn’t even stand in the hallway to hear the speakers. On the bright side: of course I’m very happy Tsvetaeva is such a draw! The book fair gave me a bunch more entries for past, present, and future translation lists, so I’ve already made some updates to the 2012 and 2013 lists and started thinking about 2014. A few to mention… New York Review Books will publish a new Krzhizhanovsky collection (translator, Joanne Turnbull) in October and a new Pushkin collection (translators, Robert and Elizabeth Chandler) next year… A Canadian publisher, Biblioasis, has a lovely illustrated edition of three Chekhov stories, About Love, translated by David Helwig… Northwestern University Press publishes quite a few translations of Russian-language books and had many on display, including copies of Anne O. Fisher’s translation of Ilf and Petrov’s The Twelve Chairs, Diane Nemec Ignashev’s translation of Victor Martinovich’s Paranoia, as well as a bilingual book of Marina Tsvetaeva’s work that includes translations by Robin Kemball. And I bought Erik Butler’s translation (from the Yiddish) of Der Nister’s Regrowth… It was also nice to see Zephyr Press’s books: Zephyr has a huge selection of translations by Central and East European authors, mostly poets published in bilingual editions… One of my favorite books I brought home came from the people of Merriam-Webster, who gave me the Dictionary of English Usage for my reference shelf… On a non-Russian note, I’m also excited about Lionheart, James Anderson’s translation of Thorvald Steen’s Norwegian-language novel, which University of Chicabo Press/Seagull Books gave me… I brought back two huge stacks of books so will stop there. Off-site events were the real highpoint of AWP, perhaps because they were planned by organizations not called AWP. An evening-with-poetry in a restaurant, for example, included readings of Danuta Borchardt’s translations of Cyprian Norwid and Barbara Siegel Carlson’s translations of Srečko Kosovel… as well as my introduction to a Russian theater in the Boston area, Theater on the Roof. An event with St. Petersburg Review that began with readings by Kadija George, Brian Sousa, and Irina Mashinski was a great opportunity to finally meet Mikhail Iossel and Jeff Parker, the editors of Rasskazy, in real life. Parker and Maria Gusev, who was also in Boston, are translating Zakhar Prilepin’s San’kya. My favorite event, though, was a reading at the Grolier Poetry Book Shop, where translators read from new collections from New York Review Books. Don Share read from Miguel Hernández and Matvei Yankelevich read from An Invitation for Me to Think, a book of translations of Alexander Vvedensky’s poetry for which Eugene Ostashevsky is listed as selector and primary translator, with Yankelevich providing additional translations. 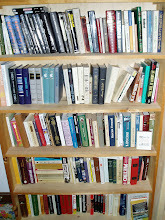 Edwin Frank, NYRB’s editorial director, likened the books to “poetry baseball cards,” fittingly so since the books are small and brightly colored, with a “collect them all” feel. Titles like “Stomach Rumbling During Confession of Love” are certainly memorable. As for coming events: anyone in the New York area interested in hearing Ostashevsky and Yankelevich read their translations of Vvedensky—and/or Share reading his translations of Hernández, which I also enjoyed—is in lots of luck. Read Russia is hosting a book launch party on March 27 for An Invitation for Me To Think. Then NYRB will host four related events in April; three will focus on the Russian Avant-Garde and OBERIU. (NYRB April event calendar) Speakers will include Ostashevsky and Yankelevich, plus Richard Sieburth, Michael Kunichika, Bela Shayevich, Ainsley Morse, and Kirill Medvedev. A special note on Kirill Medvedev: I bought It’s No Good, an English-language collection of Medvedev’s writings, from Ugly Duckling Presse at the AWP book fair and couldn’t put it down during my Amtrak ride home. The book is described as including poems, essays, and actions; it’s translated by Keith Gessen (who also wrote an introduction) with Mark Krotov, Cory Merrill, and Bela Shayevich. Gessen writes in his introduction, “I don’t know if our translations can capture the honesty, transparency, and passion of Medvedev’s writing, both in his essays and in his poems, but we’ve tried.” I’ve only read teeny snippets of Medvedev’s poetry in Russian and haven’t compared translations with originals but as I read I could certainly feel all the things Gessen was hoping to capture. And a lot more. Here are three reviews of It’s No Good that help explain: New York Times (Dwight Garner), Los Angeles Review of Books (Jeff Parker), and Three Percent (Will Evans). Though I’m sorry none of these events are close enough for my calendar, I have a great consolation prize: Dina Khapaeva will speak about “When Dostoevsky’s Nightmares are Coming True: Gothic Aesthetics in Contemporary Russian Society” at Bowdoin College on March 27. I’ve read and enjoyed chunks of Khapaeva’s very engaging Кошмар: литература и жизнь (Nightmare: Literature and Life)—she covers writers including Gogol, Dostoevsky, and Pelevin—so am looking forward to her talk. Maybe I’ll even write about it. Up Next: Igor Savelyev’s Tereshkova Flies to Mars, a noughties novel known as Mission to Mars in English: Amanda Love Darragh’s translation will be out this summer from Glas. And then Evgenii Vodolazkin’s Laurus, which brings me back to the Middle Ages in just the right way. Disclaimers: The usual. In addition to the books I mentioned receiving from publishers at no charge, NYRB sent me a review copy of the Vvedensky book; I am collaborating on a story that will appear in a book that NYRB will publish. Alphabet favorites are back! Though my entry for the Letter R (Р) is a bit limited in terms of all-out favorites, there are enough writers I like—with the hope for turns to the even-more-positive—that I’m not going to skip R like I skipped N and O. My one true favorite for R is Anatolii Rybakov, despite my somewhat limited experience reading him: Rybakov’s Дети Арбата (Children of the Arbat), the first volume of a trilogy, is enough. I read the trilogy before I started writing the blog but I did keep a book diary then, where I praised the first volume most, called the second “awful,” and summed up with, “The books were definitely flawed but they did manage to capture something important: the mood and stories of a lost portion of a generation.” Rybakov’s Тяжёлый песок (Heavy Sand) (previous post) left me with mixed feelings a few years ago, too, but I suspect I’d probably appreciate its characters and storytelling techniques far more now, after reading so much more fiction (much of it by Margarita Khemlin, who’s also from Chernigov) set in Ukraine. I also have a sentimental reason for favoriting Rybakov: he made a reading in my department when I was in grad school. I think this was in 1986, though I remember almost nothing except that Rybakov made a positive impression. Another R-letter writer I’ve enjoyed is Irina Ratushinskaya; I read Alyona Kojevnikov’s translation of Ratushinskaya’s prison camp memoir Grey Is the Color of Hope in the late eighties or early nineties. I read a fair bit of fiction and nonfiction about prison camps when I was in college but I think Ratushinskaya’s book has stuck with me through the years because her story was contemporary: she was in prison in 1983, the year I first visited the Soviet Union. Ratushinskaya’s Тень портрета (The Portrait’s Shadow) didn’t impress me much in my preblog years but I’ve heard good things about her Одесситы (The Odessans), which I bought last year and keep meaning to read sooner rather than later. As for others… Andrei Rubanov is another writer that’s left me with mixed impressions: his Chlorophyllia (previous post) and All That Glitters (previous post) were both enjoyable and pretty decent but just didn’t feel quite as good as I thought they should/could/would be. I read some of the stories in Rubanov’s Shameful Feats/Exploits at the beach last summer and thought they were decent, too. As with Dina Rubina (see below! ), Rubanov’s short fiction feels more controlled and focused than his novels. I like Rubanov’s ability to combine genres and appreciate his blunt talk very, very much. I’ve also enjoyed some of Dina Rubina’s writing, particularly her short story “Apples from Shlitzbutter’s Garden” (previous post), though I find some of her writing too overstuffed with detail. I have a couple collections of Rubina’s short and medium-length works—several readers have particularly recommended her shorter, earlier writings to me—and hope to find more that I like. As for classics, hmm, well, I guess I’m pretty much at zero… I have some vague remembrance of reading Kondratii Ryleev’s poetry in grad school but am probably more likely to seek out Aleksei Remizov, whom I seem to have ignored all these years. He sounds like a stylistically interesting writer, so I’d welcome recommendations! 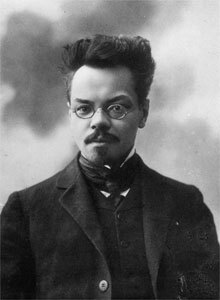 And there’s one modern poet that’s been recommended to me many times over the years, Nikolai Rubtsov, whose books I received as gifts back in the late eighties or early nineties. Up Next: A trip report about the Association of Writers & Writing Programs conference in slushy Boston. Igor Savelyev’s Tereshkova Flies to Mars, known as Mission to Mars in English: Amanda Love Darragh’s translation will be out this summer from Glas. And then Evgenii Vodolazkin’s Laurus. Image: Aleksei Remizov, via Wikipedia. Ekaterina Sherga’s Подземный корабль (The Underground Ship) is a neatly structured novel about Moscow in the noughties, in 2003, a setting that feels, in Sherga’s treatment, like a terribly lonely place. Sherga builds her novel in two lines, focusing on two main characters and their living spaces: Mstislav Romanovich Morokhov, a businessman, has just moved into an apartment complex called Madagascar and Alexander L. comes to inhabit an exclusive museum-like store called British Empire. Alexander L. comes into the book a bit later, after he and Morokhov are in the same restaurant at the same time: one of Morokhov’s friends tries to remember details about Alexander L. but comes up short. Alexander L. overhears their conversation and commences to tell his own story, in diary form. He describes his work at oddball organizations (e.g. the Club for Traditional Values, which really brought me back to my years in Moscow) and then his hiring as a night watchman at British Empire, where he’s surrounded by lovely antique items. After British Empire stops serving the public, (not that much of anybody ever came to buy much of anything anyway), Alexander L. stays on rent-free, not quite able to figure out who runs things. He eventually gets in touch with old friends and slides into a new career. Of course Morokhov and Alexander L. both live in housing named for far-away places. And both places also feel temporally removed from 2003 Moscow, with the British Empire focused on the past—there’s even an old globe to emphasize geopolitical changes—and the uninhabited Madagascar feeling futuristic with its zipping elevators and modern architecture. The housing gives the impression that both men are living “anywhere but here.” Meaning anywhere but Moscow, Russia. Morokhov doesn’t pretend to live on Madagascar and Alexander L. hasn’t traveled across time and borders to the British Empire, but both men seem, for varying reasons and to varying degrees, to be experiencing forms of what’s known in Russian as “внутренняя эмиграция” (internal emigration). Their (e)migrations become more real, more external, as the book progresses, though I don’t want to explain why. The two men’s plot lines briefly converge a few times but their situations complement each other beautifully, alternating and creating a steady balance of surrealism (a candle made to look like Morokhov’s head), odd humor (a party at which Titanic is reenacted), and suspense (who’s really running things?). All of which results in a wonderfully readable novel that feels both very real and, foggily, almost creepily, very abstract and lonely. I thoroughly enjoyed it. P.S. I should have mentioned the SLOVO Russian Literature Festival, which begins in London on March 5, ages ago... but better late than never! Thank you to Academia Rossica for the reminder. Here’s the schedule: it includes some fun-sounding events, like, oh, a translator roundtable. I won’t be there but I’m going to Boston for a few days next week, for the Association of Writers & Writing Programs conference, which has some interesting international and translation-related events on the schedule, too. Disclaimers: I learned about The Underground Ship from author Ekaterina Sherga, a Facebook friend I have yet to met in real life. Up Next: Favorites from the letter R. Igor Savelyev’s Терешкова летит на Марс, which is coming out this summer in Amanda Love Darragh’s translation for Glas; it’s known as Mission to Mars. Though I’ve only read a small part of Savelyev’s book, it feels like a nice follow up to The Underground Ship: it also takes place in the noughties and looks at ambitions, lifestyles, and crossing borders.